We are coming at you today, off an incredible record breaking week at the studio with just shy of 1000 member check in’s last week. A ‘check in’ is each time a VFitter logged in and took a live class with our trainer team. To think that just over 3 years ago, VFit was a wild and crazy dream of our owner Rachele’s and now it’s become a major vehicle of daily life for many teammates across this country. This new milestone is breathtaking and a huge cause for celebration. As we sit down this morning and reflect on this milestone, many things come to mind. Mostly, the beginning…. When the studio first launched and we had just a handful of members and only three trainers leading classes. And you bet we made mistakes. PLENTY OF THEM! We over scheduled some classes. Had the wrong formats at times. Tech issues GALORE as we learned the best ways to stream our classes. Camera issues. Website crashes. You name it – we faced it! But what we didn’t do? We NEVER GAVE UP. We believed so passionately about our core mission of spreading fitness and making it accessible for all, that we kept at it. EVERY SINGLE DAY we kept showing up and working through every barrier, road block, stumble and down right knock down. Each time we fell down, we dusted ourselves up and got up. We changed. We adapted. We kept moving forward. In life it’s not about IF you fall down. 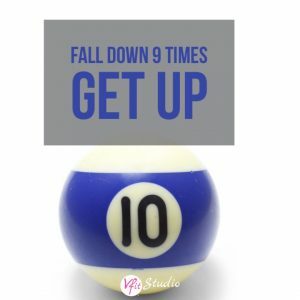 Everyone falls down – most of us on a regular basis That is life. It’s all in HOW you get up. Success comes from how you adjust your mindset. How you turn a knock down into a learning lesson. How you can take the momentum that knocked you down, and use it to get up even stronger and more determined. How you can learn that every knockdown isn’t a personal attack against you or reason to quit. This theme is a huge one that we draw upon in our platform and in coaching to our teammates. Exercise is a direct analogy of what happens in real life and how you handle it. SHOWING UP and working hard in your fitness classes, through those tough moves, maybe even an impossible move – we call those “character building” lessons. We watch this happen day in and day out with our teammates and literally jump up cheering for joy when we see someone work past a major mental or physical barrier. Burpees, mountain climbers, push-ups, and for some of us, showing up to slow down in a stretching/yoga class! You better believe that when you put the hard work and dedication into your health/fitness, that you are 100 times better equipped to handle the knock downs in your own life. If we had thrown in the towel in the first few months, we’d never be where we are today. Today we have members logging in from around the world,changing their lives. And we know this is only the start for us. That there are SO many people out there in need of a fitness solution that can work in their crazy busy life. We believe that being healthy and fit isn’t about fitting into size 2 skinny jeans. We so wholeheartedly believe that exercise transcends into EVERY other area of life, and that being busy just isn’t a good enough excuse to let your own health go. So we created a solution and by golly it’s working! Our members are stronger physically and mentally now more than at any other time in their lives. They are taking that strength and going on to do amazing things in their lives. Not only that, they are spreading their strength and confidence through their network of friends and family and making lasting, positive changes in their communities. Our members take the lessons they’ve learned through our philosophy on training and they bring that determination, will and discipline into their own lives. They chase new dreams, crush new goals, become a positive influence on those around them and SO MUCH MORE! When you fall down, what do you do? Do you just give up and say, oh well, this isn’t for me, or do you initiate those necessary movements to get yourself up? It’s not always easy to do. But we can 99.9% guarantee when you are surrounded by like-minded others who share the same core values, who are willing to put in the work and who are there to help you get back up when you need a little extra help- that if you fall down 99 times, you get up 100! And that is the number that counts. In our private YANGO group, which is a 21 day fitness challenge, we are half way through right now and a member shared Sir Captain Lawerence’s famous quote: “Don’t give up the ship!”. At Day 13, she was behind 5 squares, and knew in her heart of hearts that she wasn’t alone. She knew there were two choices to make: give up and stop the challenge, or shift her mindset and recommit to the challenge, pick up the moves she missed and encourage others to do the same. She knew that completing 15 of 21 days was still darn good and although she didn’t master in math, that 15 beats 0! You are never stuck at the bottom unless you choose for that to be the case. There’s always another option to get up, and our team is like none other, in that we will help you do so again and again and again if needed.